An Irish poem speaks of the “Drochet Bethad” - “Bridge of Life,” or the “Drochaid na Flaitheanas” - “bridge of heaven,” of Hebridean folk-lore. The World Bird is a spiritual messenger. Her winged flight takes her high into the Heavens, as her webbed feet touch down upon the waters and earth where she takes nourishment. 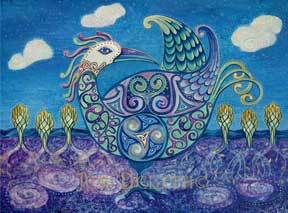 Within Celtic Mythology birds are the carriers of souls between this world, and the Otherworld. The Sacred World Bird carries our hopes and dreams from their earthly conception up into the freedom of infinite space and limitless possibliites. She stands on one trunk-like foot, symbolising her sage-like wisdom, and her affinity with the Tree of Life in whose branches she lives, eating the fruits of knowledge.